The state and local petitions are at both Live Oak locations and you may pick up a copy there if you are not able to download. If you have issues with downloading the petitions you may call Eileen Sims @ 386-362-2507 or Debra Johnson @ 386-209-5886. Update: The Florida petitions we would like to be turned in by Feb. 13, 2016. Will blog and notify citizens about the date and time of submission of the local SBOCC petitions to be presented at a board meeting. Let us get petitions signed and let our local government know what the people want! So sorry I cannot help at this time. Leaving for NC tomorrow as my sister is in hospice and organ failure. Upon return will pledge to help. Take your petitioners and file a class-action lawsuit. Petitions end up in File 13. Meetings are only put on to pacify you, and give you false hope. The media downplays all of it, because big money controls the media. The only way you can get the requisite attention is through court action. These cowards operate in a sinister manner, avoiding public attention and scrutiny. They need to be brought out into the light. I’m new to this fight, but it is already obvious that “Sabal Trails” has been laying the groundwork for at least a couple years. When they started, fracking was an illegal activity in the state of Florida … how could they possibly know they would have the state legislature and governor’s backing? Yeah, exactly: the fix is in. This decision was made several years ago (if not before), and the millions of Florida residents who could be potentially victimized by this hazardous undertaking have had no say in their lives, families, livelihoods and land being put at grave risk. 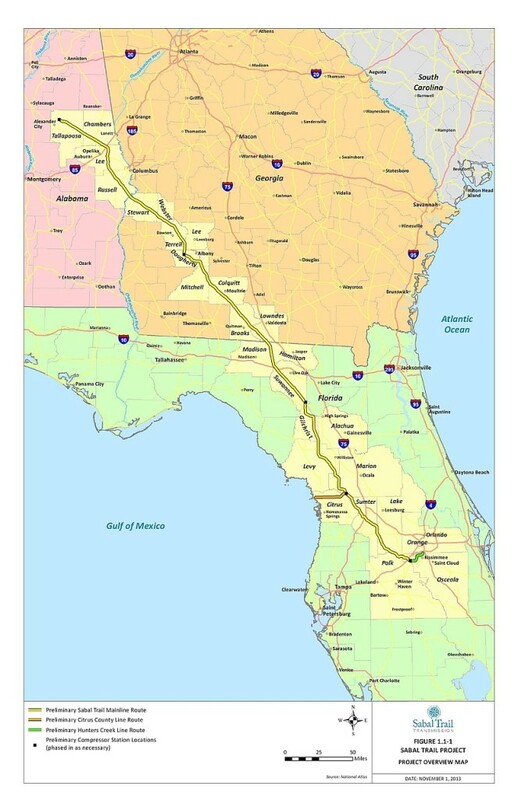 One thing’s for certain: if this pipeline does come to fruition, when an accident does occur — and it will — “Sabal Trails” will be nowhere to be found.